Omar Barghouti, a co-founder of the movement to boycott and sanction Israel, a movement which many backers hope will lead to Israel's elimination, was supposed to arrive in Washington, D.C. yesterday to give two lectures and to meet with members of Congress. Instead, he's back at his home in Israel. The Arab American Institute, one of Barghouti's hosts, announced Thursday morning that Barghouti, "prominent Palestinian human rights activist, was denied entry into the United States at Ben Gurion Airport despite having valid travel documents. We at AAI invited him to DC to participate in a number of speaking engagements and educational programs." Arab American Institute founder and President James Zogby promised to litigate the issue. "Our regressive, discriminatory discrimination laws are an impediment to free speech," he said. That didn't matter to Barghouti, who also claimed he was kept out of the country in an attempt to silence him. And he accused the United States of acting not in its own interests, but as a "proxy" for Israel. Denying him entry, he said, is "part of an ongoing repression by Israel, or by proxy, by the United States on behalf of Israel to silence human rights defenders in the BDS movement, be it Palestinian, Israeli or international human rights defenders who are active in the BDS movement." He also said he would never accept Israel without a Palestinian "right of return." But that has the potential to flood the state demographically, resulting in Israel's ultimate elimination. It isn't clear why Barghouti, who frequently visits the United States, was not allowed in this time, but it is believed to be based on national security matters and a tax evasion case against him. The Immigration and Naturalization Act allows people to be denied entry for terrorism issues, which the Capital Area Immigrants' Rights Coalition defines as "any terrorist involvement whatsoever, including incidental, that DHS 'knows or has reasonable grounds to believe' is true." As the Investigative Project on Terrorism reported Wednesday, a Meir Amit Intelligence and Terrorism Information Center report detailed Barghouti's opposition to Israel's existence and any Palestinian acceptance of, or coordination with, the Jewish state. In 2010, he spoke of "a moral and legal right to an armed resistance" against what he called "legitimate targets," including Israeli civilians living in the West Bank. In addition, he told a UCLA audience in 2014 that Palestinians have a right to "resistance by any means, including armed resistance." He denied that Jews were indigenous to the land and denied their status as a people with a right to self-determination. In a 2016 Portland State University speech, he said that "the U.S. intelligence community created the beginnings of ISIS" and created the Taliban and al-Qaida. Immigration law also allows people to be denied entry into the United States for "crimes of moral turpitude." Barghouti helped launch the Palestinian BDS National Committee (BNC) in 2007 and continues to lead it, the Meir Amit report said. BDS seeks to isolate Israel economically, politically and culturally with many leaders holding the ultimate aim of destroying it. It is considered anti-Semitic because it targets the world's only Jewish state while ignoring other countries, including Muslim-majority nations, with far worse human rights records. During a BNC conference last month, several speakers discussed the importance of "popular resistance" as an element of BDS. That's a term which at best is open to interpretation. While BDS claims to support nonviolence, Palestinian leaders often use "popular resistance" as a veiled reference to terrorism and violent Palestinian campaigns targeting Israeli civilians. Hamas's formal name translates to the Islamic Resistance Movement. Barghouti, who reportedly was trying to line up meetings on Capitol Hill, also was supposed to speak tonight at a separate Arab American Institute event "to dispel the myths around the movement and engage in a candid discussion on the struggle to advance Palestinian rights in the current climate." 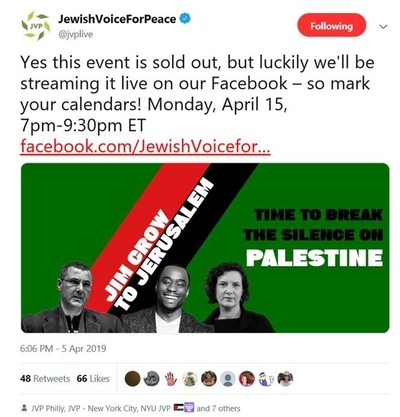 He also was set to appear Monday with former CNN pundit Marc Lamont Hill and Rebecca Vilkomerson, director of the anti-Israel group Jewish Voice for Peace, at New York University. CNN fired Hill last fall after he concluded a United Nations speech with a wish for "a free Palestine, from the river to the sea." That slogan, which is a staple of anti-Israel events, envisions a future in which Israel does not exist, and is replaced by a Palestinian state. While some argue Hill's firing shows people cannot criticize Israel, his entire speech was devoted to doing just that. His firing came only because he wished for a country's elimination. The two also are slated to appear Sunday at Uncle Bobbie's, Hill's own bookstore in Philadelphia. Barghouti's U.S. tour also was supposed to include a talk April 17 at Harvard University as an extension of "Israel Apartheid Week" there. Organizers with the Palestinian Solidarity Committee said they originally planned to have him appear last Saturday via Skype, but delayed that when they learned he planned to be in the country. "We apologize if this comes as a disappointment for some of you," they wrote, "but we are very excited to have Omar Barghouti speak in person on April 17th, and we invite you to join us for that event!"